I’m sensing a running theme here as I get busier and busier, but can’t help having more fun. There’s such a great community in this town, and I love being a part of it, and I’m making time for that as well as getting my assignments in on time and done well. I spent more than a few days locked up in my office writing, but last week it was time to get out. I attended the KW Design Meetup and the karaoke tweetup at Chainsaw on Wednesday, and on the Thursday I spoke at Ignite Waterloo, my first presentation outside of a class or a performance. 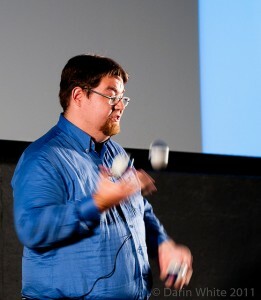 I talked about juggling, and how it teaches us about failure. You can find out more about it here. I was pretty nervous, and first on the docket, but I made it through. The Paradigms of Perception opening afterward was a breath of fresh air, and the artists really outdid themselves. I’m always fascinated by Nik’s use of texture and Meghan Simm’s black and white visions. Friday I helped out Little Mushroom at The Museum’s Murder Mystery, carrying food to all the dapperly dressed guests, and Saturday I got to do the biggest performance of my life, at my niece Gwendolyn’s 7th birthday party. I’d never performed for kids before, but we had a great time, and I got to see what my act looked like retooled into a kid-focused mad science show, rather than straight up juggling and magic. Looking ahead to November, it’s a month of more firsts. It’s my first time participating in Movember, and here and my MoSpace will be where that happens, with Movember themed music and stories, as well as pics of my hopefully awesome moustache. If you’re interested in helping kick it off, you can come out to the Mo Down Ho Down tomorrow, where I and a number of my other team members will be getting shaved, as well as enjoying poutine and karaoke at Chainsaw. Movember has also given me my first ever music gig this weekend at a benefit at Maxwell’s Music House, where I’ll be opening for Chuckee and the Crawdaddies and a few other acts. All of the door proceeds go toward Movember. The Headshots website is coming along, and should be ready to launch in a few weeks. 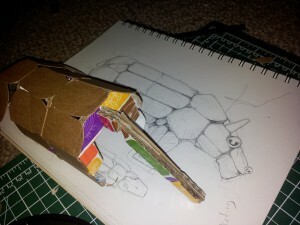 The Hippopotamus Society also has a model of what will soon be our giant cardboard hippopotamus, with more pictures on the site once it’s up and running as well. This week will also see the release of the second episode of the Educated Imagination. I’ve also put some music up on the music page finally, just some soundcloud embeds for now, until I can get the actual files uploaded here so you can download them. Whoa, slow down there! Just wanted to say thanks – you killed it at Ignite Waterloo and really help set the tone for the event. Nicely done, can’t wait to see how the videos of the evening turned out. Most help articles on the web are iancucatre or incoherent. Not this! Thanks for having me, David. Your advice during the Speaker’s Workshop was really helpful, and I can’t wait to see what you get going with TEDxWaterloo. Father_Time I doubt very seriously, that those whom elected President Obama primarily on healthcare issues have changed their minds about supporting the President's healthcare reform efforts. However the polls would suggest otherwise. The question is; Whom specifically is paying to manipulate the media? We have to follow the money and expose exactly whom these people are. One shouldnâ€™t be shy in this. These people are the enemies of democracy. They donâ€™t care about Americans. Rather they oppress people for selfish intent. RÃ¤tten borde vÃ¤l snarare anses ha tagit hÃ¤nsyn till flickan om de skickade ut honom. Att umgÃ¥s med en pedofilvÃ¥ldtÃ¤ktsman kan rimligtvis aldrig vara bra fÃ¶r ett barn. Danmark Ã¤r ett fÃ¶redÃ¶me.